Since it's introduction in 2003, Apple’s Safari has changed a good bit over the years. It's a web browser, obviously, but it's grown to be more than that. It's actually an application for which browsing the web is the primary feature. But it's the secondary features that keep me using Safari as my main browser, and enjoy using it. Of course, all the major web browsers are now applications that allow you to browse the web as well as many other things. 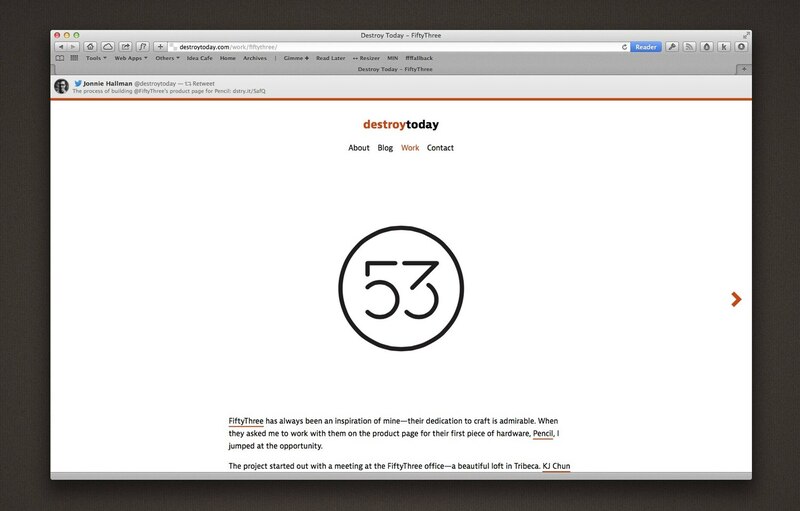 But what makes Safari most attractive to me is the overall design of these secondary features. For me it started last year when Instapaper was sold and I gave Reading List my first look. And after several weeks of using Mavericks, I noticed that I'd begun to use — and quite enjoy — some of the new additions as well. It starts with the Bookmarks Bar. Or, what used to be the Bookmarks bar. Now simply referred to as the Safari Sidebar, this is where you can access your saved bookmarks, Reading List articles, and browse links that have been shared by those you follow on Twitter. What I quite like about this change in the Mavericks version of Safari is that it's now very consistent across devices. The design is more aligned with iOS and the consistency gives a pleasing experience … familiarity is something that should not be underestimated! To expand that last point, one of the main draws of Safari is that I'm a loyal Apple fanboy. And with 3 devices that are all used in slightly different contexts, having all my information available one application that is consistent across the devices is an advantage over other options. Well, it appears that Mr. Viticci beat me to the punch this morning. For a more thorough look at some of these features, read his excellent post. Of course, this is not exclusive to Safari. Chrome and Firefox offer bookmark syncing as well. The advantage for Safari is that as a part of the operating system, it can tie many other items together with iCloud syncing. Passwords via Keychain, Twitter & Facebook accounts, and contacts all make sharing and other tasks easier with Safari. When Mavericks was introduced at WWDC earlier this year, the ability to have automatic updates from websites in the notification center caught my attention. With Google Reader shutting down, I wondered if there was potential to replace it with this new feature in OS X. It's still early, but both the lack of web sites using this feature and the fact that I dislike notifications overall have left me not using this at all. But to my surprise, the Shared Links option in Safari has really grown on me. With no intention of ever using it, I found that several times opening the sidebar would result in the Shared Links being in view rather than the Reading List. And it turns out that it's a fairly pleasant way to find new items to read. Of course, I can do the same in my Twitter client of choice. But I find Shared Links is a quieter, more peaceful way to look for a good article. It gives you the discovery aspect of Twitter, but with less noise. Now I find myself accessing Twitter in two different ways. If I want to engage in conversation, or even simply read along conversations and see what people are up to, I open Tweetbot. But if I have a few spare minutes, I find myself opening Safari and perusing through the Shared Links to find a good read. As a discovery mechanism, Shared Links has been a great addition, one I did not expect, nor was even looking for. The mechanics of the feature may need some tweaking over time. If you click a link in the sidebar, it opens in a tab, but includes a header on the top with the details of the tweet. You can also read the article, then continue scrolling to automatically visit the next item in the Shared Link. I'm not sure yet if I like this treatment, or would simply prefer the link to be opened in a new tab with the details left in the sidebar. But I'll admit, being able to click the person's avatar, which then opens a page to their Twitter account, is a nice tough. Overall, Shared Links has been a welcome addition to my browsing toolset. One nice thing that has changed since I posted my thoughts on Reading List in May is the adoption it has seen in other applications. One item of friction was that apps like Reeder and Tweetbot did not include Reading List in their Read Later services. But now Tweetbot has Add to Reading List baked right in. I assume other apps will follow as Reading List gains popularity and this simply makes it all that more attractive to me. At it's core, Safari is still a web browser, a tool for viewing content available on the web. But having other aspects packaged in with this viewing tool is ideal; saving items to read at your convenience, storing items you want save permanently, and finding new items of interest are perfect uses for a tool that can view them all. Viewing. Saving. Discovering. And all available in a well designed application … a sign of maturity.